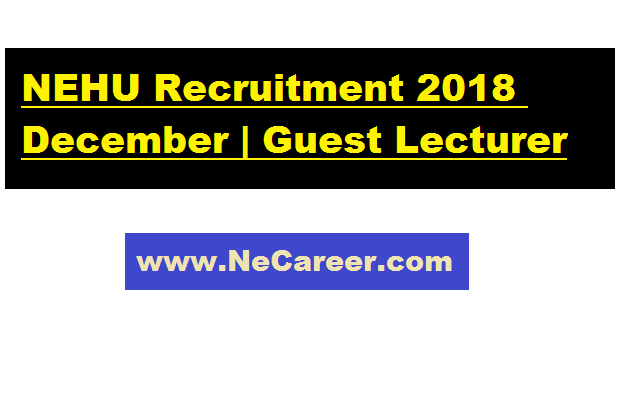 NEHU Recruitment 2018 December - Guest Lecturer (Journalism & Mass Communication) Posts :- North East Hill University has issued a recruitment notification in the month of December 2018 for filling up guest lecturer posts. 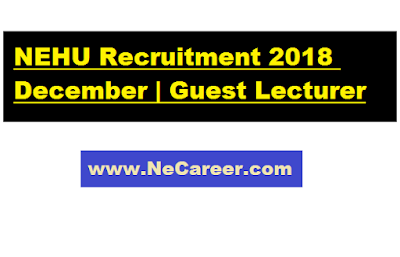 According to the recruitment , Applications are invited for NEHU Recruitment 2018-Guest Lecturer (Journalism & Mass Communication). NEHU announced Job notification to hire candidates who completed Any Post Graduate, M.Phil/Ph.D for the position of Guest Lecturer. 1. Essential Qualification: Candidates must have Good academic record with at least 55% marks (or an equivalent grade in a point scale wherever grading system is followed) at the Master’s Degree level in the relevant subject from an Indian University, or an equivalent degree from an accredited foreign university. Besides fulfilling the above qualifications, the candidate must have cleared the National Eligibility Test (NET) conducted by the UGC, CSIR or similar test accredited by the UGC like SLET/SET. Notwithstanding anything contained in sub-clauses (1) and (2) above, candidates, who are, or have been awarded a Ph.D. Degree in accordance with the University Grants Commission (Minimum Standards and Procedure for Award of Ph.D. Degree) Regulations, 2009, shall be exempted from the requirement of the minimum eligibility condition of N ET/S LET/SET. 1. The candidates appearing for the interview will not be given TA/DA. 2. Candidates are requested to bring their original documents at the time of the interview. 3. Candidates are advised to check the University website nehu.ac.in for interview notification and all updates thereafter. The Department will not be responsible for any other form of communication to the applicants/candidates. The application should reach the office of the undersigned on or before 3 p.m. of 20th December, 2018.